Samsung is all set to release its new flagships – Galaxy S9 and S9 Plus on March 16. If you are a Samsung follower, you must have already known many facts about the new smartphones. 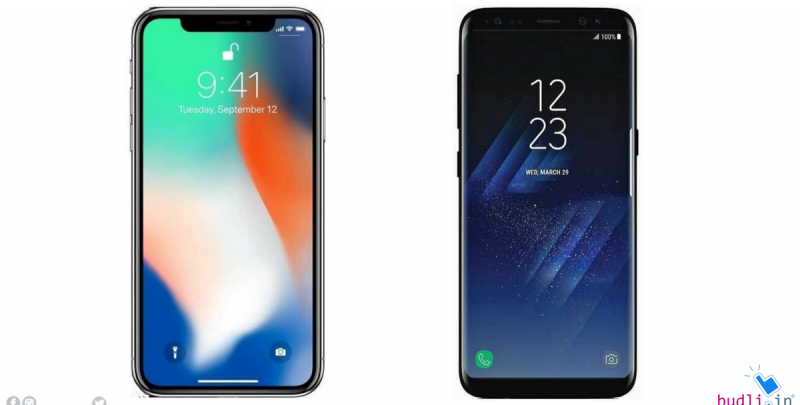 Don’t worry if you’re confused whether to bring home the new Samsung S9 Plus or the market’s top-rated iPhone X. iPhone X has already gained a lot of market and is continuing to do so. In this post, I’ll be comparing both the devices on different aspects. This post is exclusively for you guys to decide which of the two devices best suits your needs. The Samsung S9 Plus will have a 6GB RAM and will be sporting the most waited Samsung Exynos 9 Octa 9810. It is also going to be powered with an octa-core processor which is a combination of two quad-core processors. iPhone X only has a 3 GB RAM and has the Apple A11 Bionic chipset. The iPhone X has a hexa-Core processor which is a combination of a dual-core processor and a quad-core processor. Samsung S9 Plus has a thickness of 8.5 mm, a width of 73.8 mm, and a height of 158.1 mm and weighs about 189 grams. It is also said to be water resistant but only up to 30 minutes in a depth of 1.5 meters. iPhone X has a thickness of 7.7 mm, a width of 70.9 mm, and a height of 143.6 mm and it weighs about 174 grams. Even this is water resistant. Samsung S9 Plus sports a Super AMOLED display with 83.99% of the screen to body ratio and a pixel density of 531 ppi. This smartphone is equipped with Corning Gorilla Glass v5 and has a screen size of 6.2 inches (15.75 cm), with a screen resolution of 1440 x 2960 pixels. iPhone X has an OLED screen with 80.93% of the screen to body ratio. The pixel density of iPhone X is 463 ppi. It has a 5.8 inches (14.73 cm) screen with 1125 x 2436 pixels screen resolution. Samsung S9 Plus features a wide-angle selfie with an aperture of F1.7. It has an 8 MP front camera and also has features for exposure compensation, continuous shooting and high dynamic range mode. The iPhone X stands out with its F2.2 aperture lens. It has a 7 MP front camera and features like Exposure compensation, ISO control, Continuous Shooting, High Dynamic Range mode (HDR), Burst mode, Optical Image Stabilization. It also has an additional feature of retina flash. It has a battery capacity of 3500 mAh and supports quick charging. It can give a talk time of 25 hours (3G). It has a battery capacity of 2716 mAh and supports quick charging as well. It can give a talk time of 21 hours (3G). There are a few minor differences as well, the iPhone X can only support a single SIM whereas Samsung S9 Plus can support two nano-SIMs. The price points of the two smartphones are not even close. If you are planning to buy any of these devices or any other, the first and last stop is budli.in. Budli is the leading website for all refurbished electronic gadgets and offers a wide range of products for you to choose from. It only sells quality products to its customers and maintains a good will. You can easily get your old device refurbished or buy a refurbished device from budli.in. Don’t wait, just head over to budli.in to buy your dream device at lower a price.